This almost looks too good to eat! A fresh salad picked minutes before from your garden truly sums up the joys of summer. I’ve lived in Ireland for 6 years and all of the summers have been rainy. It seems, however, that this season has been a little sunnier. Here I go, so Irish, talking about the weather! For Irish gardeners and farmers, it’s a challenge to grow a variety of greens, veg and flowers to eat in June. Having a polytunnel helps , especially for a good mix of lettuce. At Boghill the greens are under cover but the flowers, radishes, chives and herbs are thriving under the ever changing Irish skies. 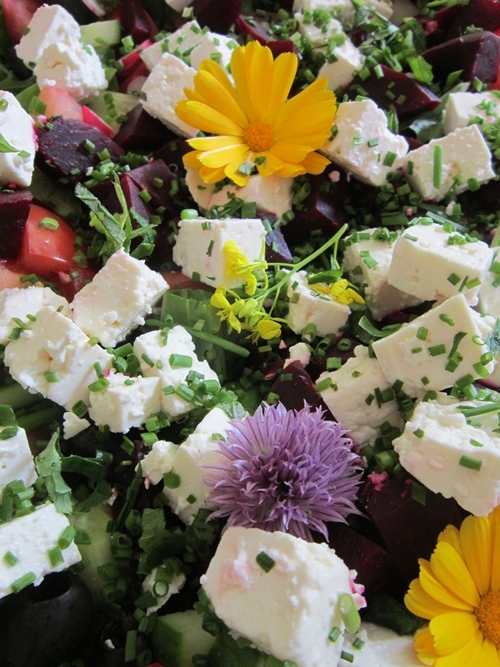 The edible flowers in this beautiful salad of lettuce, radishes, chives and beetroot are marigolds, chive flower, nasturtium (flowers and leaves) and mustard leaf flower.To top it off add a tangy local goat cheese and top with a basil vinaigrette. Your guests will surely be impressed and whether it’s a soft rain falling or a lashing wind with the kind of rain that dosen’t hit the ground (more weather talk!) the colors will bring light and a smile to your summer day! In a blender combine 2 cups of extra virgin olive oil, a big handful of fresh basil, a squeeze of 1 large lemon, 1 tbl. of honey, 1 Tbl. dijon mustard and a sprinkling of sea salt. Blend until all ingredients are thoroughly pureed. Enjoy.